Pure Patchouli Essential Oil combats mental fatigue and naturally relieves stress. 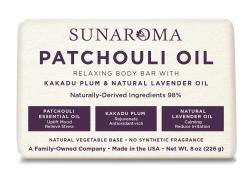 Anti-Oxidant rich Kakadu Plum rejuvenates dry skin, while natural Lavender Oil calms nerves and soothes aching muscles – leaving your body and mind naturally refreshed. Natural and Effective: Made in the USA and featuring a 100% vegetable base. It’s sulfate, paraben, Artificial Fragrance, cruelty and artificial color free and is certified by the Rainforest Alliance.